What is brown sugar, light? About the ingredient brown sugar, light. Including 537 recipes with brown sugar, light, nutrition data, where it's found, and video. 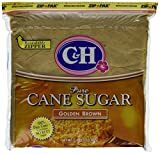 Brown sugar is often made by adding cane molasses to completely refined white sugar crystals in order to more carefully control the ratio of molasses to sugar crystals and to reduce manufacturing costs. Brown sugar has a slightly lower caloric value by weight than white sugar due to the presence of water. 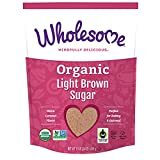 One hundred grams of brown sugar contains 373 calories, as opposed to 396 calories in white sugar. However, brown sugar packs more densely than white sugar due to the smaller crystal size and may have more calories when measured by volume. One tablespoon of brown sugar has 48 calories against 45 calories for white sugar. When a recipe calls for "brown sugar" it is usually referring to light brown sugar; dark brown sugar should be used only when specified. This is relevant primarily when baking recipes sensitive to moisture and density (such as cakes), because of the difference in moisture content between the two types. In other applications, substituting dark brown sugar over light brown will yield a deeper flavor with more caramel, much like adding molasses would do. Brought to you by Whole Foods Market. Our standards are what set us apart, and our quality is what keeps us stocking pantries, fridges and freezers with the best natural and organic 365 Everyday Value products every day. Certified Organic, Certified Non-GMO, Certified Kosher, Certified Vegan. More detail Order now to save $0.92! 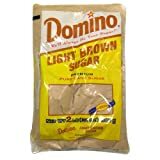 Brown sugar, light is usually found in the baking supplies section or aisle of the grocery store or supermarket. Brown sugar, light is a member of the Sweets USDA nutritional food group. How much does brown sugar, light weigh? There are 549 recipes that contain this ingredient.